This week the latest entry in the open-world action game series Far Cry will be releasing on Windows PC and both current- and last-gen game consoles, and to supplement this big release developer Ubisoft has released Far Cry 4 Arcade Poker (Free) for free on mobile devices. 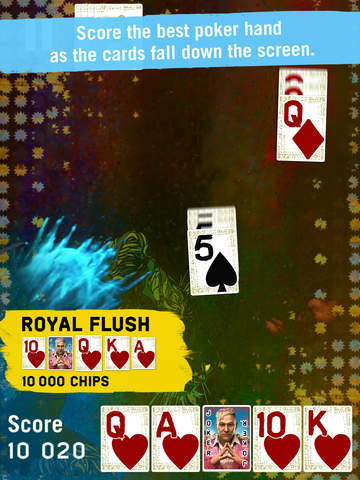 Like other mobile tie-in apps that launch alongside big-name console releases, Far Cry 4 Arcade Poker actually offers a benefit to players of the full game: you can earn currency which you can use in the full game on console or PC. Presumably this will be handled by linking up your Uplay account, though obviously I don’t have the console game to test this out. As for the game itself, Far Cry 4 Arcade Poker is a pretty interesting take on the poker card game. Cards fall one by one from the top of the screen, and you can “shuffle" what card it is by tapping on it as it falls. You can change the card as many times as you want before it hits the bottom of the screen, but once it does it’ll be added to a set of 5 open spaces which represent your hand for that particular round. Once you’ve got a 5 card hand filled out, you’ll be rewarded with coins based on how strong your hand is. It’s actually kind of a cool twist on poker. Because the cards are falling, there’s a sense of urgency to flip and find the best card to insert into your hand. There’s also a bit of risk and reward, as you might flip a card that’s pretty good for your current hand, but there might be a card out there that would be even better. So you have to decide if you want to let that pretty good card go and take your chances flipping for that better card or just settle for the pretty good one and not chance it. 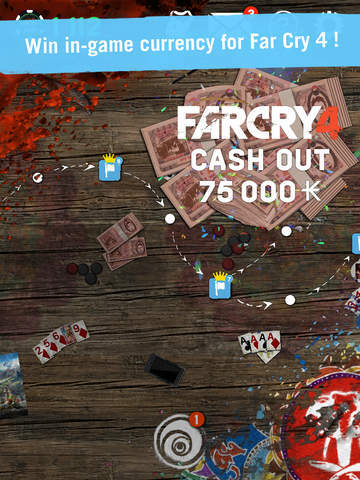 There’s a little campaign to play through in Far Cry 4 Arcade Poker too. You’re led through a series of levels that each have their own objective to complete, which at least in the early goings of the game involves getting a certain kind of poker hand. There’s also a boat load of IAP in the game, from coin packs to a coin doubler to special items that give you abilities like rewinding back to a card you’ve already flipped past or discarding a card that you don’t want in your hand. Far Cry 4 Arcade Poker is a free game, but there’s plenty of opportunity to throw real money at it if you’re so inclined. With all the “companion apps" that come out for big-name console and PC releases, I actually kind of prefer these sort of little mini-game spinoff experiences. I don’t know how well Far Cry 4 Arcade Poker will hold up on its own, but it’s a neat spin on poker and a pretty nice diversion for free, whether you plan on picking up Far Cry 4 or not.